You are invited to join us for a two-day CISM exam-focused training event on May 2nd and 3rd from 8 AM to 5 PM. The event is open to ISACA Members and Non-members. 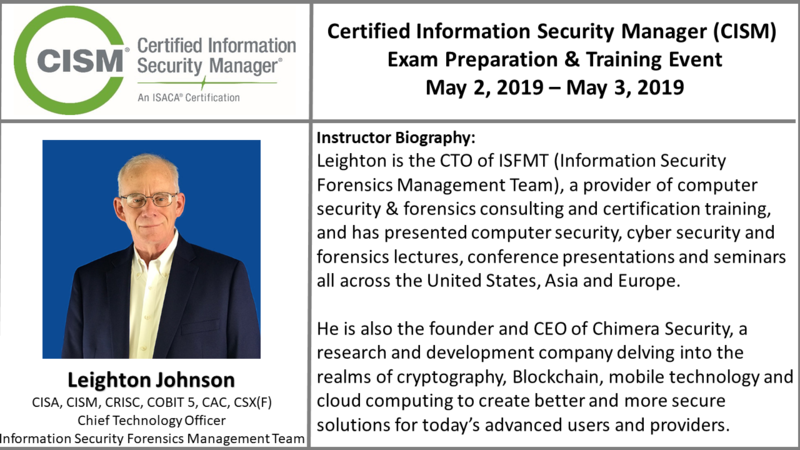 CPE: 16 hours (CPEs earned may be used by all current ISACA certification holders (CISA, CRISC, CISM, CGEIT), as well as certifications from other organizations such as, the Institute of Internal Auditor’s CIA certification. Please contact your certification provider if you have questions on whether or not the CPE can be applied to a certification not listed above. A full refund (minus a $10.00 processing fee) can be requested until April 22, 2019. Simply send an email to president@isacatallahassee.org with the registrant name for cancellation, and the name and address for the refund check. At any time, up to the day of the event, the agency or registrant may provide a substitute at no additional cost. □ How funds will be recouped or how the registration will be used if the employee cannot attend the event. □ How funds will be recouped if the event is cancelled. If the event is cancelled for any reason, then 100% of the registration will be refunded, and no processing fee will be charged. Additionally, if the event is to be rescheduled, registrants will receive the option to move their registration to the new date and time in lieu of receiving the full refund.